AlphaStar Winter Math Camp is a unique opportunity for interested and talented students to improve their math skills during winter break before the upcoming competition season. As the MathCounts and American Mathematics Competitions sequence is fast approaching, the camp will give the students a boosting opportunity to review the materials, practice and master their problem solving skills and learn exam strategies. It is a day camp which consists of lecture review, problem solving, and practice exam and strategy sessions. To see the difference and similarities among Fall / Spring courses, and Summer / Winter camps please check the table titled Four Seasons. Students are guided and trained by an expert faculty via utilizing national and international competitions in a fun and challenging environment. Number Theory, Algebra/Analysis, Geometry, and Combinatorics topics will be reviewed with practice problems. The last day of the camp will be devoted to practice exams, exam review and strategies. In the camp, students are equipped with necessary background in lectures and trained with different types of problems to master various problem solving techniques. The classes are problem solving-based whose curriculum is aligned with prestigious national and international competitions. The camp provides a motivational and challenging environment for students. There are four levels at the camp as listed below: AMC 8 / MathCounts, AMC 10/12, AIME, and USA(J)MO. Please use the self-diagnostics exams in the AlphaStar Math Courses Comparison Table at the AlphaStar Math Program page for determining the student’s level. Before or during the camp, adjustments can be made to the level depending on space availability if the instructor agrees. Below is a short description for levels. Please check http://mathcounts.org/ and http://amc.maa.org/ for more information about these competitions. For students who can already solve a dozen problems in MathCounts or AMC 8 competitions. For students who can solve a dozen problems in AMC 10 or AMC 12 competitions. For students who feel comfortable with AMC 10/12 competitions and can solve a few problems in AIME. For students who feel comfortable with USAJMO/USAMO qualification and want to improve their math levels on proof problems and proof writing. 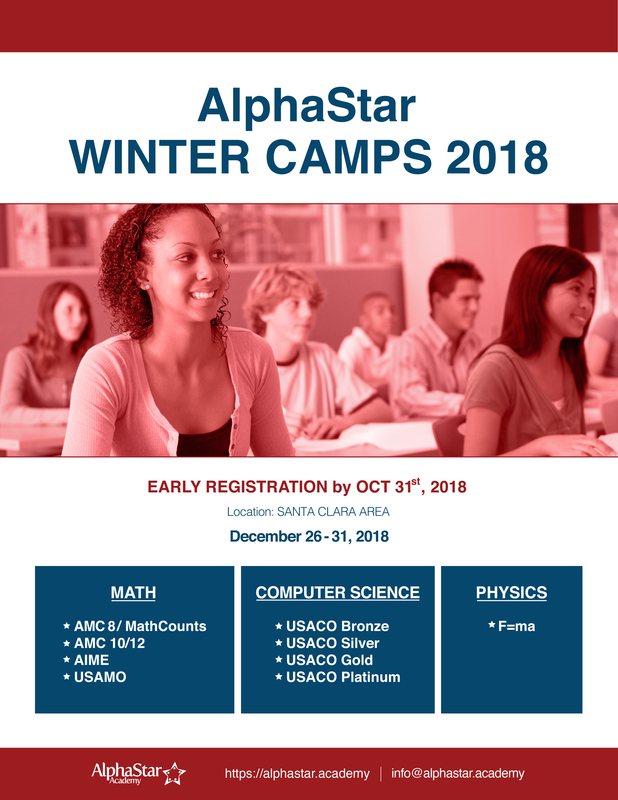 Please see the AlphaStar Math Program page for more details. Lectures are given by AlphaStar faculty and other instructors who have participation and/or training experience in national/international math competitions and olympiads such as USA Math Olympiad (USAMO) and the International Math Olympiads (IMO). I liked how Dr. Gelgi explained different ways to solve each problem. I liked how the teacher explained everything pretty clearly. Dr. Fatih Gelgi was nice and was a great teacher. The course made me more enthusiastic about learning math. I have been looking for a year-round math training program in the Bay Area for many years until A* started the Bay Area Program. The A* teachers are very dedicated. They have the skills and passion for training the students. My son has benefited a lot from this program. Thank you, A* teachers and staff!